The Fall TBOF shoot will be August 5-7th this year. 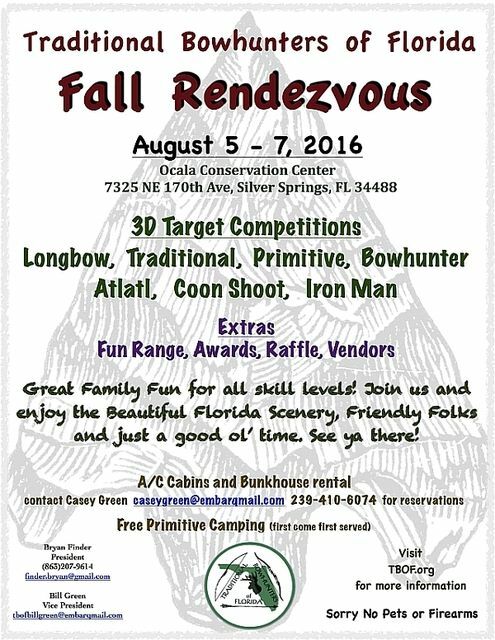 I will be there shooting the fun range and eating BBQ from the vendors smoker.. I plan to be there. I missed the spring shoot, because I had just had shoulder surgery. I look forward to seeing y'all there. Sam, I hope your shoulder is healing and your back 100%. I have a 66" 38# D/R longbow if you need it for the shoot. I plan on shooting the fun range with recurves.. Sorry, but I have to also miss the Fall Rendezvous. While on the drive down to TBOF today I got a call that my mom passed away. Between the shoulder surgery and this sad day, I have missed both of the 2016 TBOF events. I consider that a major blow to my social calendar. Good shooting, everyone. Sam, sorry to hear of your loss. We will miss you at the shoot. Dang...three years in a row I have wanted to go to the shoot. I haven't been on the website in a year and logged on today and saw I just missed it. There is a one day TBOF Shoot in January 2017..The shoot is our annual "Charity Shoot".. Keep checking here on TG or TBOF.org for exact dates and location.